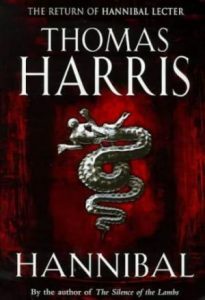 The first chapter of Hannibal reacquaints the reader with FBI agent Clarice Starling. She is working on a joint operation—a drugs raid— involving the FBI, the Bureau of Alcohol Tobacco and Firearms and the Drug Enforcement Administration SWAT teams. By the end of the raid there have been several fatalities. It’s a messy situation and Starling, who has just killed five people, ends up holding the baby when her superiors start looking for someone to pin the blame onto. During the course of her career Starling has made enemies not only within the FBI, but also in government office. She has been deliberately held back and so has never managed to achieve her full potential. Jack Crawford, who readers will remember from the previous two Lector novels, is still batting in Starling’s corner, but he is on the way out himself. Nearing his retirement, and with failing health, there is not much that he can do to divert the forces that are stacking up against his protege. Senator Martin, whose daughter Starling rescued from Jame Gumb in The Silence of the Lambs, would also be glad to take up the bat on behalf of Starling, but she is no longer in office and so can offer little in the way of support. All in all things are not going well for Clarice Starling. Dr Lecter, meanwhile, is happy with his new life, in a new country, with his new face and new identity. Things are going well for Hannibal the Cannibal. Unfortunately an old enemy with an old grudge and no face at all is looking for the not so good doctor. So are the FBI and they have placed a price on his head. Not as high a price as Mason Verger is offering though. Mason Verger is the only one of Dr Lecter’s victims that has survived the encounter, but not only did he loose face, he lost an eye and much more besides. Verger now relies on a respirator beside his bed to enable him to breathe. But he is alive and is, if anything, less pleasant on the inside than he looks on the outside. He also has more than enough money to fund the scenario that he has in mind to revenge himself on Lecter. I enjoyed reading Hannibal, the novel allows the reader to see little of what is inside the head of Dr Lecter and gives a slight insight into the making of the monster.